Stompy simulations, full scale test leg out for quote! We’ve been iterating through a design spiral trying to hammer out a leg design. Starting with rough estimates of masses and link lengths, the controls team figures out what kind of joint torques and range of motion would be required to meet the design goals and passes this information back the the mechanical team. The mechanical team takes this data to come up with a leg design, which they then run through FEA to determine the viability of the design. 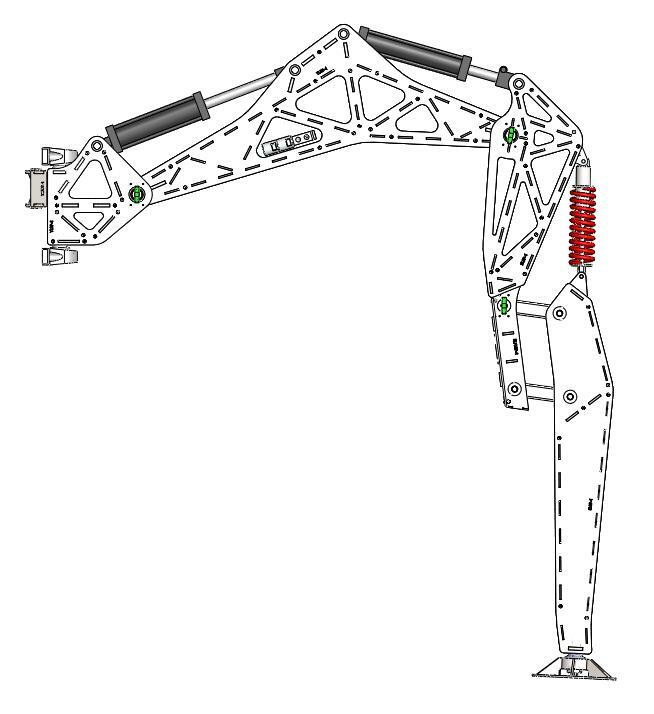 If they think it’s a viable design, they pass its critical parameters (masses, force/torque limits, actuator placements) back to the controls group, who plug the new parameters in to the simulation and give feedback back to the mechanical group, who modify the leg design, etc. These legs are designed to be cut from sheet steel on a water jet. The waterjet cuts slots and tabs so the pieces of the structural elements will slot together like Ikea furniture. We will then weld over all the tabs to make extremely strong leg pieces with minimal machining on our part. The torques on these legs is tremendous… at the hip the torque is on the order of 14,000 foot pounds. The torques decrease in magnitude as you go further out on the leg, allowing for lighter construction. The yaw link (the little chunk of metal between the body and the thigh) is made of thicker sheet steel than the rest and ends up weighing about 70lbs. The thigh link is around 200lbs without the actuator attached. One of the comprimises we had to make in the design spiral was to shorten the legs… we simply couldn’t achieve the safety factors we wanted with the legs spread out as far as they were in the original concept art. The prototype leg is out for quote at local machine shops, as is the next version of electronics, about which there will be a post soon. Also expect to see a Gimpy update! if it’s not too top secret would you guys post the quote from the machine shop? when i first saw stompy’s cad drawing my inner nerd said, “wow, bravo…”. and then, right after that, i heard my dad’s voice asking, “how much it’s going to cost?”. i hope one of you guys is married to someone who owns a water jet because you’ve got an s-load of cutting time ahead of you. anyway, what do we always say? Our quotes generally came in around $2,500 to $3,000 per leg, all told. We ended up going with a fairly expensive kind of steel which drove the price up – more about that in the next blog post. That sounds fairly reasonable given the size of the parts. How much do you reckon it’ll be once the hydraulics, axles and other components are bought? Right now we estimate the cost per leg to be about $5,000 – $2,500 for the steel, $600 for the actuators, $450 for the valves, $200 for the compliance, and the remainder billed to miscellaneous hardware. Previous Previous post: Swag Design Contest! Next Next post: THE LEG CART LIVES!